Vans Triple Crown Ratings Leader Wade Carmichael Bows Out. Here’s some of the action with the whole story below. Benji Brand winning his ROund 2 heat. Marco Giorgi of Uraguay (pictured) posting one of the highest rides of the day, a 9.30 (out of a possible 10.00) to advance into the next round at the Vans World Cup of Surfing on Saturday November 28, 2015. 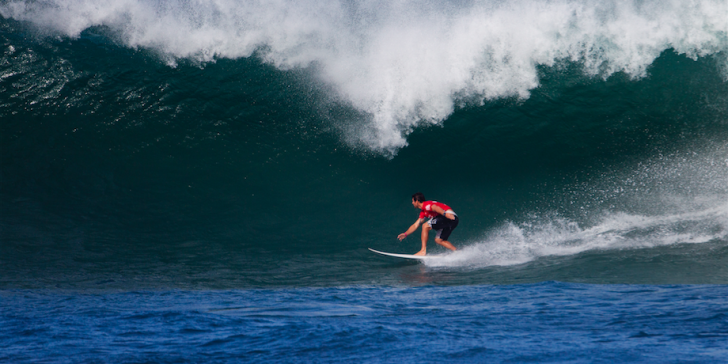 Gonzalo Zubizeretta of Spain (pictured) winning his Round 1 heat at the Vans World Cup of Surfing at Sunset Beach on Saturday November 28, 2015. Sunset Beach, North Shore, Oahu, HAWAII – (Saturday, November 28, 2015) — Sunset Beach delivered a challenging new swell for competitors at the Vans World Cup today – the second stage of the Vans Triple Crown of Surfing on Oahu’s hallowed North Shore. Sunset’s deep water lineup demanded surfers transition from the small wave boards they rode at Haleiwa one week ago, to big wave equipment and a whole new level of athleticism.The field was dramatically cut as twenty-foot wave face heights and strong side-shore trade winds added another level of intensity to the challenge. Among the casualties: early Vans Triple Crown series leader Wade Carmichael (AUS); Tiago Pires (PRT); and Billy Kemper (HAW). Athletes were repeatedly tested by Sunset, known as the most challenging wave in the world. Despite the tricky surf, there was a spirited blend of international and local advances from familiar names as well as underdog break through to maintain the mix. Posting the highest single wave score of the day, Marco Giorgi (URY) carved out a 9.30 from deep on the outside Bowl, unleashing a handful of powerful turns. The only surfer donning the Uruguay flag in the Vans Triple Crown of Surfing, Giorgi advanced behind one of the few South Africans of the event, Beyrick De Vries, and ahead of Luke Shepardson (HAW) and Michael Wright (AUS). This is Giorgi’s third time competing in the Vans Triple Crown, however it has been a few years since the 27-year-old has been on the North Shore. 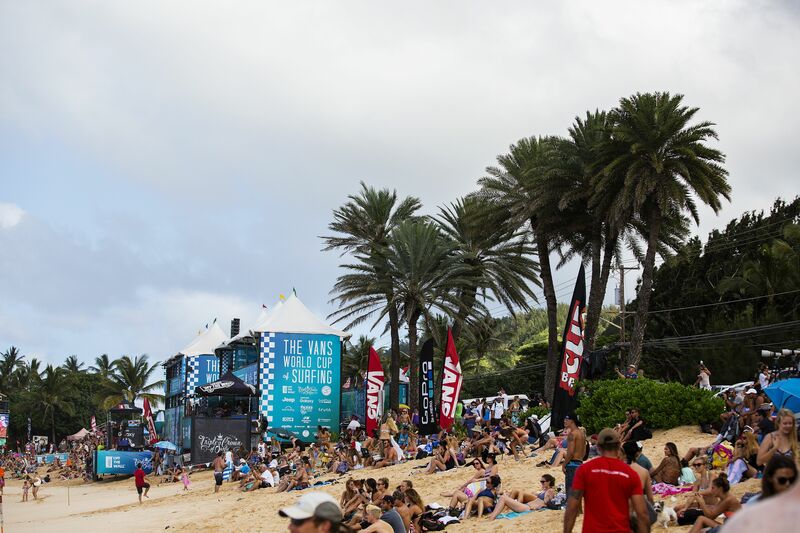 Vans Triple Crown rookie Benji Brand (HAW) and progressive Honolulu surfer Seth Moniz (HAW) made impressive charges through Round 1 and 2. Both narrowly snuck past veteran competitors in their respective heats before meeting each other in an exciting Round 2 match with Tanner Hendrickson (HAW) and Michael Rodrigues (BRA). The two advanced for a second time today and will compete in Round 3 against seeded surfers and tour athletes when competition resumes. In his first stab at the series, Brand made it through the first round with a 7.00 and a 4.67 to best competitors Charles Martin (GLP), Nomme Mignot (FRA) and Timothee Bisso (GLP). Recent winner of the $20,000 inaugural GoPro Of The World challenge for his minute-plus barrel at Skeleton Bay and a 9th place finish at the HIC Pro in October, Brand has already made a solid mark this season. Gonzalo Zubizarreta (ESP) of the Basque Country had a notable performance against a stacked Hawaiian heat. The 30-year-old took down three known North Shore forces – Mason Ho, Myles Padaca and Kiron Jabour – with a combined heat total of 13.73. Zubizarreta committed to a critical snap in the pocket on a solid double-overhead wave for a 7.00, while the other competitors were left trying to better their mid-range scores. Ho managed a 6.50 and 5.67 to advance through to the next round. Joel Centeio was in top form with a display of confidence in the tricky Sunset waves. The veteran remains in the top two on the regional ratings, just behind Maui’s Ian Walsh who will enter the draw in the seeded Round of 64. Centeio started off with a 4.77 and backed that up with 6.07 on an explosive wave, narrowly missing a thick lip and riding out to safety in the channel. The ever entertaining Jamie O’Brien (HAW) advanced behind Argentinian Santiago Muniz with a combined heat total of 11.87. O’Brien has been surfing with an ankle brace after a minor injury that kept him out of the recent HIC Pro, yet looked confident and fluid. 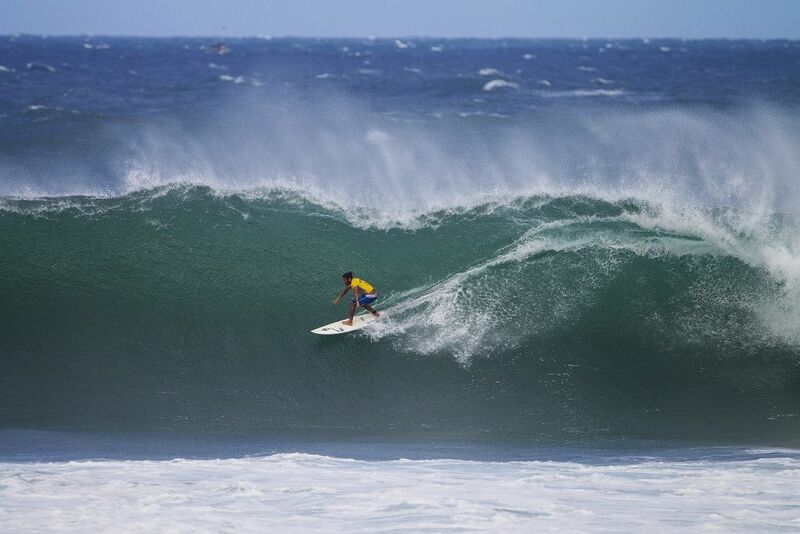 Muniz looked equally loose on his two high scoring waves: a 6.00 and 6.07. Kaito Kino (HAW) has been on fire this season, starting off with a third place finish at the HIC Pro, the official Vans Triple Crown qualifier event, and advancing through to Round 3 of the Hawaiian Pro with standout performances. Today the 21-year-old moved through the first round along with fellow Hawaii athlete Evan Valiere from Kauai. Contest organizers expect the competition to resume tomorrow with an 8AM start and 30-minute heats. The forecast is for maxing Sunset surf in the 3- to 4-times overhead range early, then slowly easing through the day with moderate to breezy ENE trades.